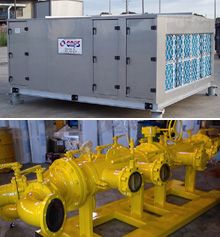 Custom Air Products & Services, Inc. offers the ability to custom manufacture various types of HVAC equipment to meet your demanding requirements. Stainless steel, aluminum, coated structural steel, or hot dipped galvanized steel base material. Modular design—knock down for installation through a 3 foot door. Heat—electric, hot water, or steam. Customer specified electrical classification—NEMA 1, 3R, 4, 4X, or 7. Optional disconnect switches or combination starters. Customer specified cabinet materials—stainless steel, aluminum, or galvanized steel. Customer specified skid materials—stainless steel, aluminum, coated structural steel, or hot dipped galvanized steel. Customer specified electrical classification—NEMA 1, 3R, 4, 4X or 7. General purpose, explosion proof, or zone rated. Custom solution or modified equipment from major manufacturers.